This cake recipe is gluten-free – meaning, instead of plain flour, I use almond meal. Most people expect it to taste WEIRD when I say it’s gluten free, but OMG it’s such a gorgeous chocolate cake that is worthy of serving up at a tea party. I don’t like chocolate cakes that are too rich, dense, sickly sweet, and loaded with eggs and sugar. Which is why I adore this recipe, because the cake is light, moist, soft, and just divine to eat. It’s not dry or crumbly and it’s a winner every time I make it. It’s also simple to make, and it only has a few ingredients. 7. To make the whipped cream, just add sugar to the cream and mix with an electric mixer for 5 minutes until thick and fluffy. 8. 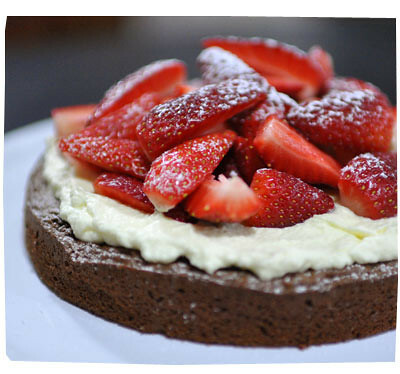 Spread the cream on top of the cooled cake, place the strawberries on top. Dust with icing sugar just before serving.